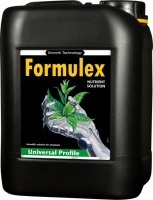 Growth Technology Formulex is possibly the most famous nutrient for rearing young plants. While Formulex is great for seedlings and cuttings that are beginning to need feeding it is also great for all vegging soil-grown plants and it even works in hydro-systems and works especially well as a foliar feed. Gentle but very effective! •Growth Technology – professional quality products for professional results!